Hip raps inspirational rhymes that help his friend Hop to achieve his dream of taking part in the Blueberry Hill bike race. The story teaches that you can achieve anything if you put your mind to it. Focus on your dreams and go! 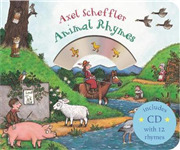 A collection of twelve animal nursery rhymes with a CD.